While Charlie Sheen was in Aspen with his mouth shut, and Dr. Conrad Murray was in Los Angeles claiming his innocence, Gary Coleman was in Utah admitting to his guilt. Funny how the smallest man acted like the biggest and actually owned up to what he did. Oh, and it’s Gary’s birthday today, too. Nice. And by nice I mean that’s pretty darn poopy. I bet you have Gary, I bet you have. Coleman, 42, accepted a plea deal on domestic violence charges in the Santaquin Justice Court. In return for pleading guilty to a charge of domestic violence/criminal mischief — a class B misdemeanor — prosecutor Brett Rich agreed to drop a domestic violence/assault charge. The charges stem from an April incident between Coleman and his wife, Shannon Price. Justice Court Judge Sharla Williams fined the former child star $595 and ordered him to take classes on avoiding domestic violence. She also suspended a 30-day jail sentence, dependent upon Coleman paying his fine in the next year and completing the classes. “Just mind your P’s and Q’s, and you’ll be in good shape,” Williams said. Coleman said he would pay the fine in monthly $50 installments. 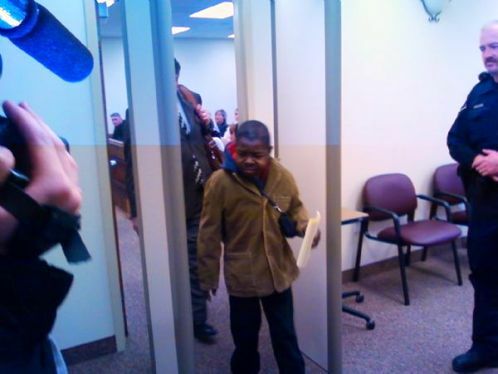 “I’ve been in better places on my birthday,” Coleman said before the hearing. Afterward, he told reporters that there was not much to say, as he avoided a big fine and a jail sentence. “I’m going to lunch,” Coleman said as he walked out.